Sci-fi monsters love their hive hierarchies. The notion of a collective consciousness is quite handy for an alien/monster species to have, since it's identifiably alien to us individual-minded humans (unless you're a devoted communist), but doesn't take up lots of exposition time to explain - we get the idea. But unless you're in an all-out war scenario (and sometimes even then), you need someone to oppose the good guys directly, so most collective enemies manage to sprout a member of their kind who'll be doing all the talking. Alien queen, Borg queen, Rachni queen (lots of queens, thanks to the ever-useful bee analogy - so much so that in Doctor Who's own "Ghost Light", the alien mistook the British Empire for a hive, since why else would there be Queen Victoria? ), and of course, the various Cyber Leaders. "But you promised me! You said I would never be converted!" "That was designated a 'lie'." See, that's what happens when you don't bother watching the old serials - if she'd seen "The Five Doctors," she'd have known "promises to aliens have no validity." The Cyber Leader first appeared in 1975's "Revenge of the Cybermen," during Tom Baker's tenure (and, sadly, one of its infrequent off days), but the general idea had been around for ages - in fact, only in 1967's "The Moonbase" did true Cybermen (ignoring the individually-named proto-Cybermen of "The Tenth Planet") not have something to tell them what to do. 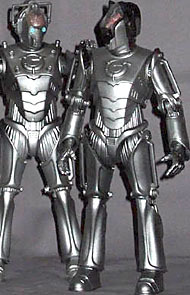 "Tomb of the Cybermen" famously introduced the Cyber Controller, while "The Wheel in Space" and "The Invasion" both featured variants of the immobile Cyber Planner computer in dispenser-of-orders roles, but it wasn't until someone took a regular Cyberman and painted his earmuffs black that the idea really got cemented. "The Next Doctor" - 2008's whimsical cyber-steampunk Christmas special - inherited its Cyber Leader from the earlier appearances of the revamped Cyberman (Cybus models, or "Pete's World" Cybermen, depending on who you ask), but did a bit of a mish-mash to make him stand out more. Where the Cyber Leader seen in "Army of Ghosts"/"Doomsday" was simply a regular model with black antennae - literally a regular model, upgraded to a Leader via data-dump whenever the previous one got destroyed - the new Cyber Leader, also referred to as "Cyber Lord" (probably just to sound Victorian though), combined the Leader's traditional black accents with the new exposed-brain head built for the Cyber Controller in "The Age of Steel". That was handy for Character Options, since they already had a Cyber Controller action figure, and some black paint. The figure (like the costume) isn't just a repaint though - it's a mix of both, with the Controller's head atop a regular Cyberman body, without the data cable ports on the chest of the Controller. It lacks the arm-mounted blasters of later Cybermen, but uses the more relaxed, open hands of the Controller figure, rather than the curled (traditional "action figure hand") grips of the original blasterless Cyberman figure. Having done oodles of Cybermen by now, CO makes no mistakes with the paint job on the standard body, getting the brushed steel look just right. 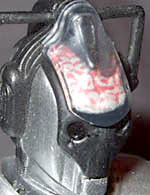 The head is unaltered from the Controller in sculpt, but "The Next Doctor" augmented the earlier Leader's paint job, carrying the black over onto the faceplate as well, and down the back of the head like a mohawk. Compared to the real thing - available on DVD or as a life-size mask toy (that's a toy mask, not a Cyberman with a transforming eighteen-wheeler to ride around in) - the transparent forehead is much simpler, covering the entire area in one go, whereas the original brings the vent-like protrusion atop the brain through the clear shield. At this scale, with the clear plastic by necessity relatively thicker, the vent thingy sits beneath it - it throws the look off slightly, but only if you're going to be very detail-obsessed, and the overall resemblance is clearly there. With the body unchanged, the above-standard articulation survives intact: balljoint neck, swivel/pin shoulders, pin elbows, swivel wrists, shallow balljoint waist (with the tilting very restricted by the armour, but not entirely cut off), balljointed hips, pin knees, and balljointed ankles. With no weapons (aside from the omnipresent electrocution grip) the only accessory for the figure is its BAF bit - two bits, rather, like most of the rest of this set, the "Tomb" Cyber Controller's left arm and, er, cyber package. Incidentally, if you're noticing a slight red tinge to the BAF bits in these reviews, ignore it - it's just the reflective paint bouncing up the colour of the furniture next to my photo spot. With this Cybermen mini-series on sale for some time - far from easy to find by now, in fact - it's a bit late to be offering predictions, but this figure still strikes me as the one that'll mostly be bought just to complete the set/BAF. It's a good figure, delivering exactly what any collector who wants the Cyber Lord would need of it, but a variant from one Christmas special, however fun, can't really stack up to the weight of history and nostalgia that drives the classic Cybermen in the series. Still, even if you're just BAF-hunting, you won't feel cheated.